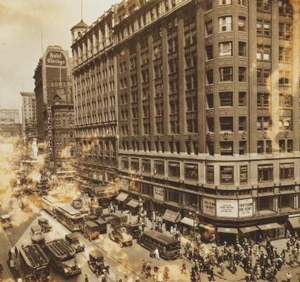 An unnamed tenant signed a lease to pay a whopping $9,000 per year for 440 square feet of prime Times Square ground-floor retail, the New York Times reported 107 years ago this month. In today’s dollars, that amounts to more than $224,000, or roughly $509 per square foot. 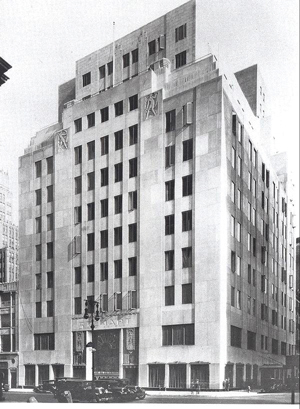 The lease was for a mid-block space with 11 feet of frontage on Broadway in the soon-to-be-built 12-story Fitzgerald Building on the corner of West 43rd Street. The news report noted that the rent was higher than “some of the choicest locations in the busiest Fifth Avenue retail district,” and that the corner retail space of the future building was asking $16,000 per year on a 10-year lease. The Fitzgerald Building was not there for long, though. It was replaced by a two-story, 1,000-seat Toffenetti Restaurant in 1939. The eatery was razed in the 1990s to make way for 4 Times Square. An investment team led by two men who would soon become some of the city’s most well-known property owners signed a contract to buy the historic St. Moritz Hotel, the New York Times reported 56 years ago this month. Attorney Lawrence Wein and Harry Helmsley of Helmsley-Spear bought the 35-story, 1,000-room hotel — now the Ritz-Carlton New York, Central Park — from the Charles Taylor family. Wein and Helmsley had already syndicated the Taft Hotel, the Plaza Hotel and others, both in and outside New York by the time they purchased the hotel on Central Park. Later that year, the duo would go on to buy the Empire State Building. The pair didn’t say how much they paid for the St. Moritz, but in 1985 they would sell it to Donald Trump for $72 million. Trump sold it to an Australian entrepreneur for $180 million just three years later, and it’s changed hands numerous times since. Workers demolished two historic stone bas-relief sculptures that adorned the facade of the Bonwit Teller Building on Fifth Avenue and 56th Street on the orders of the site’s then-33-year-old developer, Donald Trump, the New York Times reported 37 years ago this month. Trump’s decision shocked many in the art world, especially because months earlier he had promised the sculptures to the Metropolitan Museum of Art, as long as the cost to remove them was not “prohibitive.” Trump Organization Vice President John Baron — which was later revealed to be a pseudonym of Trump himself — told the Times that “the merit of these stones was not great enough to justify the effort to save them,” and that their removal would set back demolition work by at least a week and a half on the future site of Trump Tower. Some appraisers had estimated the 15-foot-tall Art Deco sculptures were worth “several hundred thousand dollars,” but the Trump Organization claimed that three independent appraisers pinned their value at around just $9,000. The Times reported a day later that some bronze grillwork from the entrance of the Bonwit building was also missing, despite a similar promise from Trump to preserve it for the Met.